BSBO would not exist without the generosity and dedication of our AMAZING volunteers! From assisting with research projects, helping with education programs, and interacting with the public in our Gift Shop, the Observatory has a project that needs YOU! The expandable sections below the photo gallery have all the information you need, whether you're already a member of our team or if you're hoping to get involved as a new volunteer. And THANK YOU for your support of BSBO!! First and most importantly, THANK YOU so much for donating your time and energy to help us with the various projects we undertake on behalf of the birds. Our work simply would not be possible without your dedication and enthusiasm! As of June 2016, we're in the process of reorganizing the ways we interact with our volunteer team and how we track the hours you all work, so please let us know if you have any questions about changes we're making or suggestions for improvements. RECORDING YOUR HOURS WORKED: Most of the time you'll record your hours on a timesheet while you're at BSBO or at one of our events, but in case you need a timesheet when you're at home, here are the forms to use. Just please remember to turn them in at BSBO by the end of each month so we can add these to any other hours you've already recorded. 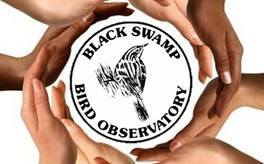 Thank you for your interest in volunteering at Black Swamp Bird Observatory. ​We ask that you complete this form so we'll have a better idea of your skills and the types of things you're willing to help us with. By submitting this form you give us permission to add your name to our mailing list for periodic volunteer newsletters. Be sure to click the "submit" button at the bottom of the page when you're done! Below are some of the volunteer opportunities that come up during the year. Please indicate the ones in which you'd be interested. If you're interested in volunteering in our songbird banding station, click HERE. Biggest Week in American Birding: This 10-day festival each May has become so successful in large part thanks to our army of festival volunteers. There are opportunities to help assemble welcome packets before the festival, as well as working at information tables and leading field trips during the festival. If you'd like to join our Biggest Week team, please click here to go to our Biggest Week in American Birding website volunteer page. Thank you for your interest in volunteering at our songbird migration research station. ​Please complete this form and click the "submit" button at the bottom of the page.